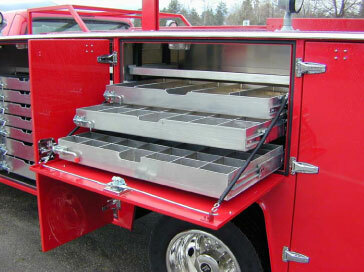 The original Brutus drawers are made of aluminum and are hand built directly into your new service body. These drawers are full width and depth unlike bolt in cabinet packs and offer the best use of valuable space. 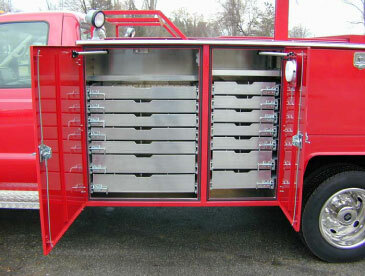 The drawers can be custom ordered in any depth 3" or greater and any width you desire. The drawers come with your choice of 250 lb or 500 lb roller bearing sliders, stainless pin latch, hand cut out, and adjustable dividers.